Only towards the end of the 19th century, did endpapers reflect the subject matter of their books. Some thematic endpapers portray characters or present intriguing scenes from the text. If successful, these glimpses whet the reader’s appetite. Other thematic endpapers depict the locale of the book, establishing the atmosphere and mood as does the overture of an opera. 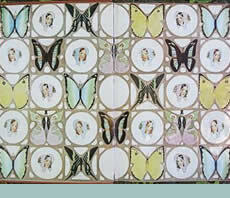 Many successful pictorial endpapers make imaginative use of the two page format. Some are symmetrical, some show a procession of characters, some use repeating motifs, and some feature a pathway which leads, as it were, into the text. Occasionally, the front endpapers and back endpapers differ, the back endpapers adding more information or else serving as a curtain call and goodbye. Some of the finest book artists, like Walter Crane and Jessie Wilcox Smith, unified the designs of the endpapers, cover, title page and illustrations, so that they complemented each other and corresponded with and enhanced the book’s contents. The endpapers pictured in this part of the exhibit depict a variety of themes, from earthbound to celestial.